Warning! This will be another picture heavy post, but they *are* cute pictures and I know you'll enjoy them. The past two weekends have been busy with dance competitions - first in Durham, then in Smithfield (which is just past Raleigh). This whole dance team thing is a wild and crazy adventure and there's a steep learning curve for newbies like me. 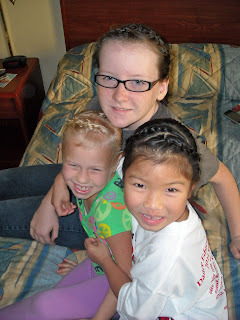 Our first trip, L and I stayed with another mom and daughter from her team. 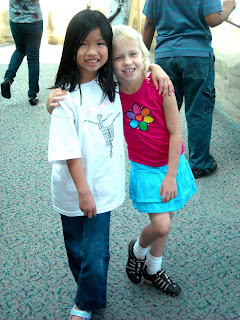 We're both homeschoolers and the girls are both the same age with the same high level of energy and crazy, so it's a good fit. L and I arrived early so we watched part of the solo/duet competition Friday night, then we met A and her mother at the hotel where the girls were WOUND UP. It was a competition! They were in a hotel! Together! The next morning we honored A's request for a "fried egg" for breakfast, then we headed over to the venue. There's nothing quite like the chaos that is a dancers' dressing room for a competition. Stuff and people crammed into too tiny spaces. We lucked out when the boys' dressing room was moved just as we arrived so we quickly took over their vacated space and had room to breathe for a few minutes. I shot these pictures of A and L stretching. Don't they make adorable pirates? The very next weekend was competition #2. A's mom had to go out of town for a homeschool conference, so we took charge of A for the competition. 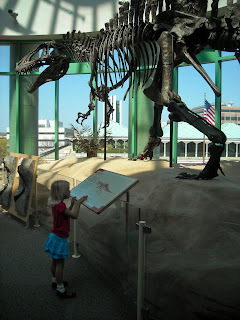 Mr. at Home and K got to go with us and we decided to break up the long drive with a stop in Raleigh to get L an American "birth certificate" and take the girls to the Museum of Natural Sciences. Unfortunately, the person who could take care of the paperwork for us wasn't there, but the museum was. 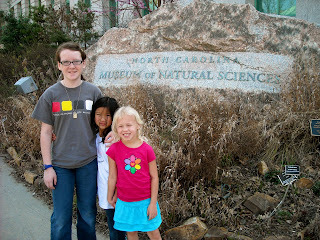 The NC Museum of Natural Sciences is an awesome place to visit. 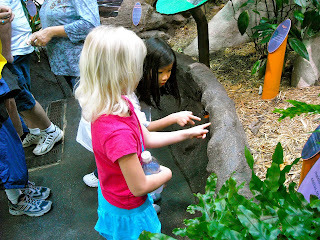 The kids were fascinated by the butterfly exhibit and the large skeletons of whales and dinosaurs. 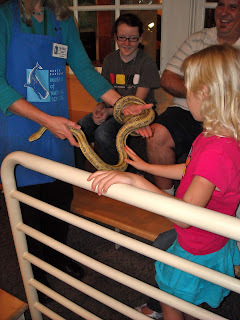 There were snakes to pet and gemstones to admire. 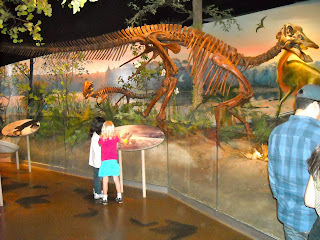 For young kids, it wouldn't be terribly fascinating as there were precious few things you were allowed to touch. 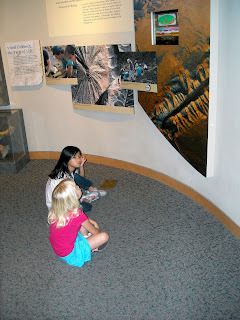 It was mostly a look and read kind of thing, but even the 7-year-olds were well-entertained for a couple of hours. The little girls were ready to go fairly early, so we headed down the road again to the hotel and their indoor pool. Where my girls proceeded to show A how mean they could be to each other. Sigh... They don't often get in fights, but having an audience brought out the worst in them. Thankfully, a time-out showed them the error of their ways, but the pool fun was over so we went back to the room for showers and hair braiding and dinner at Cici's. A wasn't too keen on the idea of Cici's, but she stuffed herself just as much as the other girls. An early bedtime and an early alarm for everyone, then two little girls needed buns and full make-up, the room had to be packed up, and then we raced out the door for the competition venue. The dressing rooms were a little bigger this time so they didn't seem so crowded, but we still didn't have much room. Thankfully, K helped get A dressed and kept track of all her clothes and costume pieces. It was a long morning waiting to perform then waiting for awards, but the team had improved somewhat between competitions #1 and #2 and we came home with a higher rating this time around. It was a good trip, but somewhat crazy with 2 high-energy 7-year-olds to keep track of. Next competition isn't until April 9th, so we have a nice long break AND it's at the beach where we're staying all weekend in a beach house with some of the other moms and kids. Can't wait! Pictures of Cindy Jae at "college"